MuLa lives in a Thai village by the Burmese border. 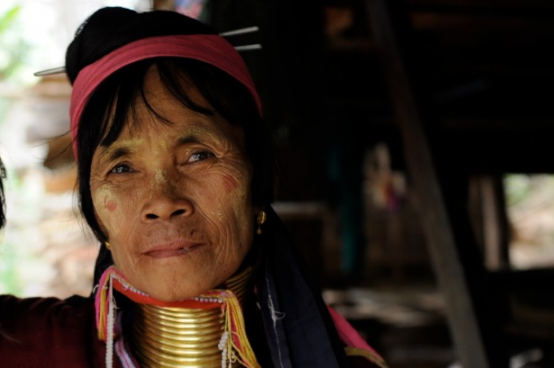 She is from the Kajan people and her neck is adorned with characteristic gold neck rings. Her life has not been easy as she had to leave her native Burma and seek refuge in Thailand while her only daughter stayed home. MuLa makes her living selling souvenirs to tourists but the family’s financial situation is very difficult. Monika Pawluczuk’s documentary captures the woman’s struggle with her depressing fate and her unquenchable longing for a better life. author of documentaries: "When I Am A Bird", "Models", "So You Should Change", radio and television journalist, now she is in the course of filming her next documentary film with the working title "Before the Dawn". She is the co-author (with Katarzyna Miller) of a book, translated into several languages, titled "Being A Woman and Not Going Crazy". She is a cultural studies graduate at the American Studies Center at Warsaw University, a journalism department graduate at the Journalism Centre in Warsaw, and a DOC PRO Documentary Programme graduate at the Wajda School.